When it comes to surveillance, your face may now be your biggest liability. Privacy advocates, brace yourselves – the search capabilities of the latest surveillance technology is nightmare fuel. 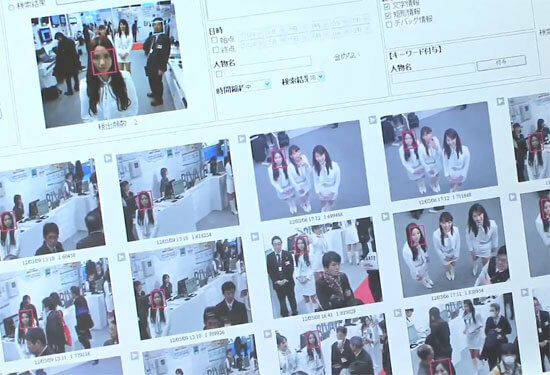 Hitachi Kokusai Electric recently demonstrated the development of a surveillance camera system capable of searching through 36 million images per second to match a person’s face taken from a mobile phone or captured by surveillance. While the minimum resolution required for a match is 40 x 40 pixels, the facial recognition software allows a variance in the position of the person’s head, such that someone can be turned away from the camera horizontally or vertically by 30 degrees and it can still make a match. Furthermore, the software identifies faces in surveillance video as it is recorded, meaning that users can immediately watch before and after recorded footage from the timepoint. This means that the biggest barrier in video surveillance, which is watching hours of video to find what you want, is gone. The power of the search capabilities is in the algorithms that group similar faces together. When a search is conducted, results are immediately shown as thumbnails, and selecting a thumbnail pulls up the stored footage for review. Because the search results are displayed as a grid, mistaken identifications can be ruled out quickly or verified by pulling up the entire video for more information. The scenarios that this system could be useful for are endless. The police, for instance, could find individuals from old surveillance video or pick them out of large crowds, whether they are suspects or people who’ve been kidnapped. Or if a retail customer is caught stealing something on camera, the system could pull up footage from each time the customer has been in the store to identify other thefts that went unnoticed. Rapid search of the video database allows users to review video around key timepoints. The company, which specializes in video cameras for the imaging, medical, and security markets, states that the system is ideally suited for large-scale customers, such as law enforcement agencies, transportation centers, and retail centers. The system will be released in the next fiscal year presumably customized to specific customer’s needs. Interested parties have to contact the company directly, which is probably wise in order to control whose hands it ends up in. And this means that soon, the only thing that’s going to be anonymous anymore are the agencies and organizations using the software. While this news should make anyone concerned about privacy shudder, it really was only a matter of time before something like this was developed. Likewise, it means that competing systems will follow until systems like this are common. So it will be up to legislators to define how the technology can be used legally as with other surveillance systems, like license-plate recognition cameras.